While making your own PCBs at home is one of the best marks of a competent builder, if you want to give your project a more professional vibe, you’re going to need to do better than bare copper traces on a piece of fiberglass. To help out his fellow makers, [Chris] sent in his Instructable on creating a solder mask for homemade circuit boards using a minimal amount of tools and materials easily sourced from the Internet. [Chris]’ soldermasks are made from UV curing paints he found on eBay. Of course the traditional green paint is available, along with paints very similar to the Sparkfun red or Arduino blue soldermasks. After brushing the soldermask paint onto his home-etched circuit board, [Chris] printed out the solder mask onto a piece of transparency film using a laser printer. This mask is vitally important if you ever plan to solder your board; by covering the pads you wish to solder, the paint won’t cure and can later be removed. [Chris] cured his soldermask by leaving it in the sun for a half hour. After the paint was dry, he removed the excess paint covering the pads with a little bit of turpentine and some elbow grease. While [Chris]’ paint had somewhat of an ugly matte finish, the soldermask does its job, protecting the PCB traces while leaving the pads uncovered and ready to solder. I’m not sure if this is an electronical sound idea, but if the matte finish is a bad thing you could cover the pads and add some high gloss clear coat. Pretty nice. Any idea how much coverage you can get out of a tube? I spotted that yesterday. He’s done a nice job and written a nice Instructable. However I recently tried out this (also on Instructables) and it worked very well and gave a much nicer looking result. There is a little more equipment needed but I think it’s worth it. I didn’t think it’d be polite to leave the same comment on his Instructable, but if you’re thinking of going for a home solder mask you should consider both. Wow! I wonder if this stuff is etch resistant? It might make a good alternative to pre-sensitized boards, particularly with a set up like http://www.das-labor.org/wiki/LaserExposer featured a while ago on HaD. Maybe if it could be thinned and sprayed on instead of squeegeed it might dry a bit quicker. The problem with using it as etch resist is that it is will probably be very hard to remove once you’ve etched the board. I like when people search for an alternative solution to professional services, but if you had the price of each item needed to make the pcb, then the soldermask and sometimes the silkscreen, it can become costly. The pros have still one big advantage over any homemade solution : vias . A friend of mine (who never finishes projects) described a hobby as something where you do it for the love of process rather than for the end result. We make PCBs at home partly because of the quick turn around time and partly because we just want to see if we can. The fact that you can get a better one made for you at a lower cost is missing the point! I totaly agree with your friend’s definition. I just meant to say that, while doing things yourself is a very rewarding task, trying to achieve professional results by any means may makes you lose focus regarding your original goal. To me, soldermask for home usage doesn’t justify the price and hassle. The same could be said for using a microcontroller instead of an FPGA or discrete components. Focus on what you’re interested in, if that includes etching PCBs, then etch PCBs. If you’d rather spend your time coding or designing a circuit, then order them from a production house. When it comes down to it, no one is building completely from scratch. I only sent in the tip, it’s not my instructable! Please credit the guy who actually made it! 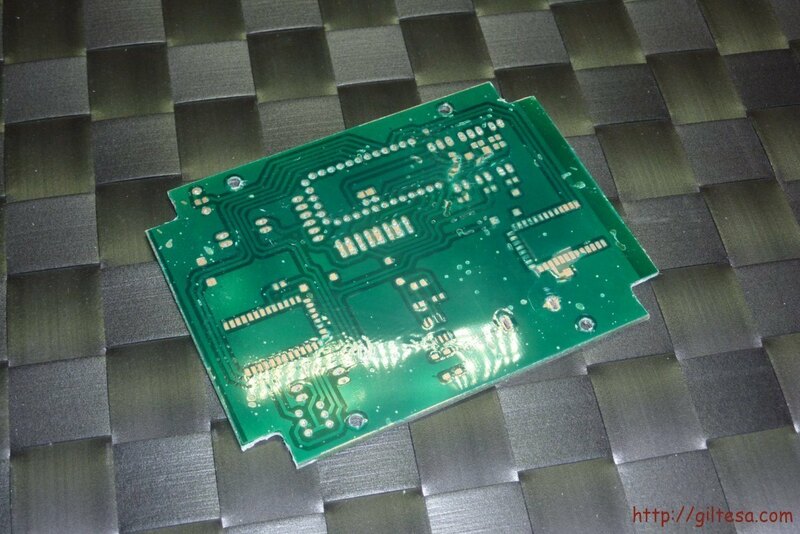 I’ve used this method in some of my PCBs, but I do not like, not always goes well, it is difficult to leave it perfect, the paint may peel plate. Thus was my last plate. For the time you spend putting all of this together and making it work well, you might as well use one of the cheap online PCB manufacturers for a *really* professional result. My time is worth something. If I was unemployed, or a student, I might consider this type of work, but even as a student you can get some sweet discounts. If I need one board, and know that I will never need another, I might get out the developer and transparencies and etching tank and go to work… Otherwise, no way, man! Another technique I ran across on some forum a few years ago is to use a stained glass paint. Pebeo Vitrea 160 serieas to be exact. I got mine at Michaels but it isn’t listed on their website so they may or may not still carry it. It comes in many different colors and is water soluble until baked in an oven. You can thin it out with water and spray it onto the board with an airbrush for a nice even coat. I use polymide film tape and solder to tin just the pads I want to mask. After painting and curing, I use solder wick too remove the painted solder from the pads. This results is a board with a descent solder mask and tinned pads. One potential downside to this is that the repeated heating of the board with the oven, soldering the pads, then desoldering the pads, and finally populating the board can take a toll on cheap adhesive used to hold the copper to the substrate and result in lifted pads if you are not careful. Using better copper clad board can help with this. I recently made a board using this technique and took a bunch of pictures. Sometime soon, I hope to put them up on my website. Just worth noting. The paint has an interesting property. It doesn’t cure properly on top of laser printer toner. If you use the toner transfer method to put a negative design on the board, you can then part cure it and use acetone to clean off the parts you don’t want. This gives a very fine resolution to the board. Just note, permanent marker does not stop the curing process. This could be a blessing (silkscreen) or a curse (touching up toner damage). That’s really cool! I’ll try that next time I make a board. Using toner instead of solder to mask the pads before painting could save a significant amount of time. After applying the white masks will not dry me. What temperature used, the mask has dried? When I received my bottle of uv paint it only filled the bottle half way. Iused 98% isopropyl alcohol and thinde it ouit. Now it works great. thanks for putting on to this paint.